This page describes the history of 5S. It examines the shipbuilders in Venice, Toyota and the Piggly Wiggly connection and the Japanese version of 5S. To explore the history of 5S in quality assurance it is necessary to begin with Venetian shipbuilders of the 16th century. The Arsenal of Venice during Elizabethan times was a paragon of efficiency in manufacturing. The enclosed Arsenal employed thousands of shipbuilders and followed an assembly line approach. Different pieces from which a galley was made were prepared in workshops, ready to be assembled into a whole ship. Story has it that a 1574 visit from King Henry III of France prompted the shipbuilders to build an entire galley in the two hours or so in which Henry attended a banquet in the Arsenal's Great Hall. Whether the ship was sound or not is a matter of conjecture, but it did aptly demonstrate the efficiency of the shipbuilding operation. Skip to post World War II Japan. Toyota's President, Kiichiro Toyoda's, and chief engineer Taiichi Ohno developed Toyota's Total Production System, or TPS, a philosophy that still provides the foundation for manufacturing and logistics at the Japanese auto giant. On a visit to the U.S., they studied the assembly line at Ford and while acknowledging the enormity of the manufacturing machine, they were also dismayed by the waste. Even though it was an assembly line, there was a lot of waiting on steps so as to get to other steps, and completed work piled up. The routine overproduction led to routine layoffs and rehires. Kiichiro Toyoda also visited a Piggly Wiggly Supermarket and was quite impressed with their system of reordering and restocking as they were purchased. This is the basis for what is now called "just in time" or JIT inventory. To achieve this at Toyota, they reduced the inventory to what they would need for a short period of time and reorder. This is the real starting point of history of 5S. The goal of 5S is to give a feeling of ownership of process to each employee. The 5S's as they originated in history of 5S principles are as follows, with the Japanese word first, followed by the American translation of the word. Phase one is Seiri. This means going through all the tools and materials in the plant work areas and only keeping the items that are essential. All other tools and items are stored or discarded. The Americanized version of this is "Sorting." Phase two is Seiton, a process that focuses on efficiency. The goal is to arrange tools, equipment, and parts so that they encourage work flow. Tools and equipment should be placed where they will be used, and the process should take place in an order that has maximum efficiency. This concept wasn't easy to translate into an English term beginning with the letter S, but attempts have produced "straighten," "set in order," and "sort." The concept that's important is that tools and activities should be ordered so as to maximize the flow of work. Phase three is Seiso. This is simply the need to keep the workplace clean and neat. When every shift ends, the work area is cleaned, and everything goes back in place. This process lets everyone know what goes where, and lets them have confidence that everything is where it needs to be. Maintaining cleanliness is part of the daily work task, not just something that gets tackled when the workplace becomes too messy. The American version of Seiso is "sweeping" or "shining." Phase four is Seiketsu. This simply means that work practices operate consistently and in a standardized manner. Each worker knows what responsibilities he or she has in keeping the first three S's. The American word is "standardizing." Phase five is Shitsuke, which refers to maintaining high standards and reviewing those standards. It is a way to maintain focus on the this system of operating and not allowing people or processes to slip back into old habits. Any suggested improvements should be considered in light of the first four S's. The Americanization is "sustain." Whether a sixth phase (safety) should be added is the matter of some debate. 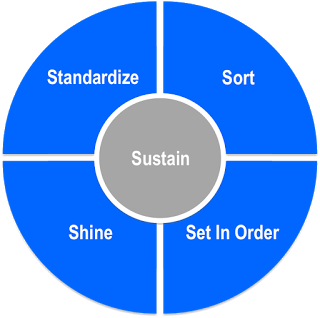 Some believe that the five S's automatically result in a safe workplace, while others contend that poorly designed 5S processes can undermine safety. Click here to Learn about 5S project software, StreamLiner.